Dr Peter Barnes from the University of Florida says astronomers have a good grasp of how stars such as our Sun form from clouds of gas and dust, but for heavier stars – ten times the mass of the Sun or more – they are still largely in the dark, despite years of work. “Astronomers are still debating the physical processes that can generate these big stars,” Dr Barnes says. Using CSIRO’s ‘Mopra’ radio telescope – a 22m dish near Coonabarabran, NSW – the research team discovered a massive cloud of mostly hydrogen gas and dust, three or more light-years across, that is collapsing in on itself and will probably form a huge cluster of stars. The gas cloud, called BYF73, is about 8,000 light years away, in the constellation of Carina (“the keel”) in the Southern sky. Evidence for ‘infalling’ gas came from the radio telescope’s detection of two kinds of molecules in the cloud – HCO+ and H13CO+. The spectral lines from the HCO+ molecules in particular showed the gas had a velocity and temperature pattern that indicated collapse. The research team calculates that the gas is falling in at the rate of about three per cent of the Sun’s mass every year – one of the highest rates known. 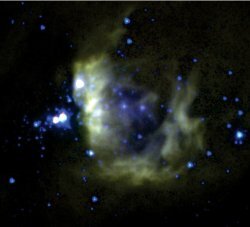 Gas cloud BYF73 was found during a large-scale search for massive star-forming regions – the Census of High- and Medium-mass Protostars, or CHaMP. This is one of the largest, most uniform and least biased surveys to date of massive star-forming regions in our Galaxy.